Service type: Select the type of the service you want to use in MarvinSketch. Fill in the required fields, according to your service type selection. 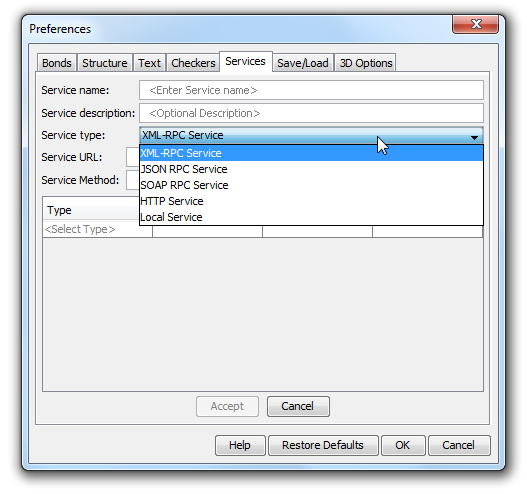 Local Service, JSON RPC Service, XML-RPC Service, HTTP Service, SOAP RPC Service. 5. Specify the order of services by moving them up and down using the Up/Down buttons. 6. Add a new service to the list, or remove the selected service from the list by the add and remove buttons. 7. You can export the set services configuration to an XML file and import it for later usage by clicking on the appropriate buttons of the Services tab. Open Service Configuration XML file from URL is also available; Click on button and specify the URL of the configuration XML file. The location of the set services configuration is displayed at the bottom of the configuration window.